Akro Mils, 39085, Attached Lid Container, 21 1/2 in. x 15 in. x 9 in. Akro-Mils Attached Lid Container, 21-1/2 IN. L, 15 IN. W, 9 IN. H, Industrial Grade Polymer, Grey. Sold by the EACH. 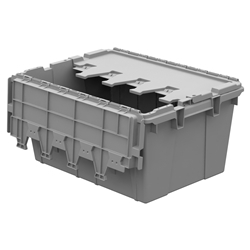 Reusable shipping, distribution, order picking & storage containers.